In 1979, Holger Czukay’s career was at a crossroads. Can the group he cofounded in 1968, had split-up. After releasing eleven albums in eleven years, one of music’s most innovative groups were no more. This came as no surprise to Holger Czukay, who was about to resume his solo career. During the ten years Can had been together, Holger Czukay’s solo career had been on hold. He had released his debut solo album Canaxis 5 in 1969. Since then, there had been no sign of Holger’s sophomore album. With Can consigned to musical history, Holger began work on Movies, which was released in 1979. Movies which will be reissued by Gronland Records as Movie! on 3rd June 2016. However, back in 1979, Movie! marked the comeback of Holger Czukay, after the demise of Can. The last few years had been tough for Holger Czukay. He had watched as Can slowly disintegrated. Latterly, Can were a far cry from the group that released some of the most innovative Krautrock that was released between 1969 and 1977. This included their legendary golden quartet of albums. From Tago Mago in 1971, to 1972s Ege Bamyasi, 1973s Future Days and 1974s Soon Over Babaluma, Can were all conquering colossus of a group. They were musical pioneers, who released groundbreaking and genre-melting music. This music would go on to influence several generations of musicians. However, latterly, things had gone awry for Can. The problems began in 1977, when Rosko Gee and Rebop Kwaku Baah had joined Can. They made their debut on Can’s ninth album Saw Delight, which was recorded at the group’s Inner Space Studio in Cologne, in January 1977. When recording of Saw Delight got underway, Can’s music had changed since they released their golden quartet. Landed in 1975, and 1976s Flow Motion saw Can’s music move towards a more traditional sound. So much so, that Flow Motion featured a disco track, I Want More. It reached twenty-six in the UK. Can were still basking in the glow of their hit single when work began on their ninth album. At Inner Space Studio in Cologne, the old and new members began work for the first time. Drummer Jaki Liebezeit was joined by guitarist Michael Karoli and keyboardist Irmin Schmidt. Bassist Holger Czukay was relegated to adding a myriad of sound-effects. Replacing Holger was former Traffic bassist Rosko Gee. He was joined by another former member of Traffic, percussionist Rebop Kwaku Baah. Along with the original members of Can, the new recruits spent January 1977 recording Saw Delight. Before Saw Delight was released, critics had their say on Can’s ninth album. It was an ambitious album that found Can embracing world music. Alas, Saw Delight was way ahead of its time, and failed commercially. For Can, it was a familiar story. They had always been trailblazers, who were ahead of their time. This had been the case with their golden quartet. History repeated itself on Saw Delight, which if it had been released in the eighties, like albums by Paul Simon or Peter Gabriel, would’ve been a commercial success. Sadly, by then Can were no more. That was still to come. However, already things weren’t well within the Can camp as they began recording the prophetically titled Out Of Reach. Following the departure of Holger from Can, Baah and Gee began to dominate the recording of Out Of Reach. However, they didn’t understand what Can were about. As a result, gone was the free flowing sound that featured on classic Can albums. It was replaced by the rhythmic discipline that Baah and Gee introduced. This hampered Can. Jaki Liebezeit’s drumming was reigned in, and became almost subdued. Considering Jaki provided the group’s heartbeat, this was a major faux pax. Only Michael Karoli’s guitar sound remained unchanged. Everything else was changing. The critics rounded on Out Of Reach. They found very little merit in Out Of Reach. Gee and Baah were rightly blamed for the album’s failure. Even Can disliked Out Of Reach. Holger, Michael, Jaki and Irmin later disowned Out Of Reach. So it was no surprise that when Out Of Reach was released in July 1978, that the album passed record buyers by. By then, Can had already recorded their eleventh album Can. Holger’s role in the making of Can was minimal. Following the failure of Out Of Reach, the members of Can began recording what became Can. Remarkably, Gee and Baah were still part of Can. Sadly, Holger was not longer a member of Can. He’d left during the making of Out Of Reach. His only involvement was editing Can. Can had been recorded during February 1978, at the familiar surroundings of Inner Space Studio in Cologne. As the group reconvened to record their eleventh album, Can were a group on the brink. It was touch and go whether they would survive the recording sessions. They did, and the result was Can, which provided a challenge for Holger Czukay. Even Holger’s renowned editing skills couldn’t save Can. Try as he may, he could only work with what he was given. Once he completed editing Can, which is sometimes referred to as Inner Space, the album was released in July 1979. Again, critics weren’t impressed by Can. It received mixed reviews. They agreed one one thing, that Holger was sadly missed. However, little did anyone realise how bad things were within the Can camp. Things had gotten so bad, that Can split-up after the release of Can. It proved to be their swan-song. However, even before that, the warning signs were there. Holger had “felt marginalised since Gee and Baah became part of Can. They had hijacked Can,” who were now consigned to musical history. A once proud and innovative group became a shadow of its former self since 1977. This saddened Holger, as he decided to resume his solo career. There was a problem though. Holger hadn’t really been making music since 1976. The last three Can albums saw Holger editing the music. So, Holger set about finding “his own sound again. I had “been through this with Can,” Now he’d have to do so again. It would be worth it though, when he released his first solo album since 1969s Canaxis 5, Movie! 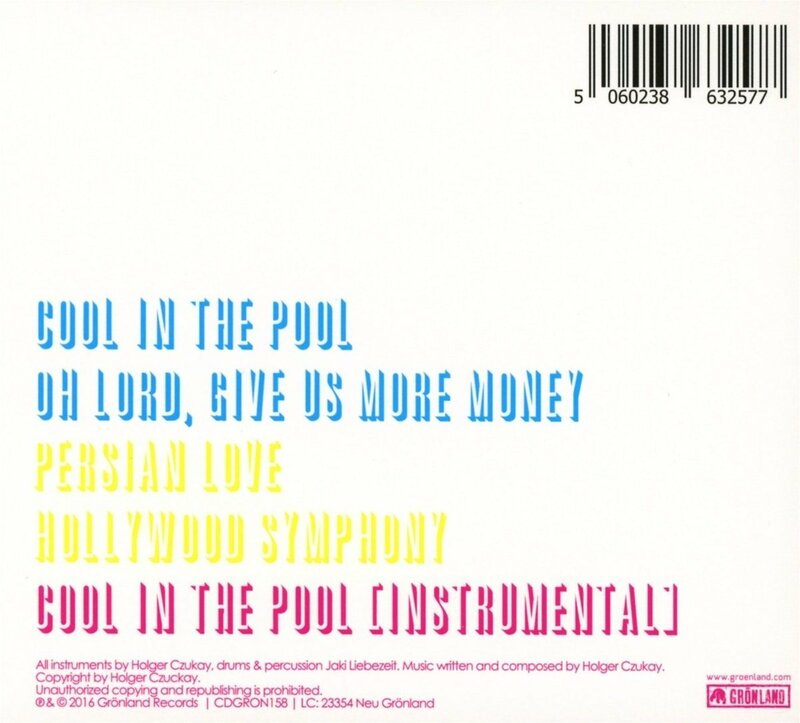 For his sophomore album Movie, Holger Czukay wrote four new songs, Cool in the Pool, Oh Lord, Give Us More Money, Persian Love and Hollywood Symphony. These four tracks were recorded with friends a foe alike. Recording of Movie! took place at Inner Space Studio, Cologne. This was where Can had recorded the best music of their career. It was like a Can reunion. Jaki Liebezeit played drums and congas on Movie! The other original members of Can played walk-on parts on Movie! Guitarist Michael Karoli featured on Oh Lord, Give Us More Money; while Irmin Schmid added grand piano. Incredibly, Rebop Kwaku Baah was drafted in to play organ on Oh Lord, Give Us More Money!. Meanwhile, Holger was akin to a one-man band. Not only did Holger record Movie, he also played guitars, bass, keyboards and synths. Then when the four songs that became Movie! were recorded, Holger mixed and produced the album. Movie would see Holger hailed the comeback King. When Movie! was released in 1979, it was to widespread critical acclaim, and was hailed as one of the best albums of 1979. Movie! found its way into NME’s album of year list. Sounds’ magazine went even further, and called Movie! one of the top 100 albums. Holger’s decision to embark upon a solo career had been vindicated. He was back doing what he did best, creating ambitious, groundbreaking and pioneering music on Movie! Cool In The Pool opens Movie!, and shows another side to Holger Czukay’s music. A briskly strummed guitar is panned right, before a French horn is panned left, and ushers in the rhythm section and Holger’s vocal. It’s tinged with humour, theatre and faux sass. Especially as Holger suggests: “let’s get Cool In The Pool.” Backing vocalists reply: “is it hot?”Meanwhile, washes of keyboards join the rhythm section who nail a 4/4 beat. It provides the heartbeat, as Holger adds a variety of instruments, sounds and samples. Everything is added at the right time, as if Holger is putting together a musical jigsaw. He adds a chiming guitar, scratchy strings, a wailing braying, horn and a variety of samples. This includes a cockerel, snippets of dialogue and what sounds like a horse whinnying. By now, the newly enlivened Holger plays a starring role. So do the keyboards, and rhythm section who inject some funk into a track where the hooks haven’t been rationed. The result is an irresistible, innovative and timeless slice of hook-laden musical magic that once heard, will never be forgotten. Oh Lord, Give Us More Money is a thirteen minute epic. Straight away, washes of synths add a degree of drama. They’re joined by a crystalline guitar, probing bass, rustling, rumbling drums and crashing cymbals. Meanwhile, stabs of the grand piano add to the darkness and drama. Again, Holger has carefully chosen each instrument, and deploys them when it makes sense. This includes a variety of synths, a funky bass and searing, blistering guitar. It cuts through the arrangement, which is powered by Can’s former rhythm section. By then, there’s a progressive rock influence. Then the arrangement is stripped bare, and only a pulsating bass remains. That’s until a burst of drama signals the arrival of Holger’s vocal. It’s delivered quickly and with passion, as a myriad of disparate sound flit in and out of this musical vortex. Shrill synth strings, a pulsating bass, a dark, dramatic piano and a myriad of samples and sounds are added. Snippets of dialogue; animals snarling and growling; traffic, sirens and thunder punctuate the arrangement. Still, Holger ensures the drama remains. Key to this is the grand piano and funky rhythm section. Then as futuristic otherworldly sounds are added, Holger’s vocal veers between whispered, impassioned and pleading. Later, the arrangement is understated before Michael Karoli adds a crystalline, blistering guitar and join with the rhythm section and organ in adding the finishing touch to a dramatic, cinematic opus. Deliberate washes of synths sweep in as Persian Love unfolds. They’re joined by an impassioned vocal, while a chirping guitar joins washes of synths and exotic percussion. The cinematic arrangement literally meanders along, constantly painting pictures of a distant, ancient land. Then the rhythm section add a pulsating heartbeat. They’re soon joined by a crystalline guitar which is panned left, and replaces the synths, On their return, the arrangement continues to meander along. Holger adds snippets of dialogue, and then a sample of a Middle Eastern female vocalist. Her quivering, heartfelt vocal gives way to another sample of male vocalist, while the rhythm section, congas and guitar lay down the groove on this fusion of Afro-reggae, funk and world music. Later, a chirping guitar dances above the bass while the drums provide the heartbeat on this beautiful captivating and genre-melting track. Hollywood Symphony a fifteen minute epic, closes Movie! Radio waves bristle and quiver, before a thunderous rhythm section and guitar set the scene for Holger’s tender, thoughtful vocal. Synth strings accompany him, while bursts of the thunderous rhythm section and guitar are added. Meanwhile, Holger’s vocal has been multi tracked, with a touch of delay add to the second vocal. Soon, sound effects and samples are added, as the arrangement veers between dramatic, cinematic and melodic. Still, the earlier drama remains. Now it comes courtesy of a bristling, crystalline guitar runs; a broody, moody bass and bubbling, futuristic, sci-fi sounds. Along with a myriad of samples, they punctuate the atmospheric arrangement, before it’s all change. Having built up the drama, the tempo rises, as synth strings and the rhythm section propel the arrangement along. They’re join by squelchy, acidic synths and the earlier bristling, crystalline guitar. Later, swathes of synth strings, samples and a blistering guitar solo play leading roles as the tempo drops. However, the drama remains for the rest of this captivating, sprawling, cinematic epic. It marked the welcome return of Holger Czukay. After three years away, Holger Czukay certainly hadn’t lost his Midas touch. Instead, he had reinvented himself musically with a truly eclectic album that captured the imagination of critics and record buyers alike. They realised that Movie! marked a return to form from the former Can bassist. For the other members of Can, this must have been embarrassing. They had backed the wrong horse back in 1977, when Holger decided to quit Can. The problem lay with Gee and Baah, who Holger felt had “hijacked” Can. However, rather than sack Gee and Baah, the other members of Can watched as their old comrade left the group he had cofounded. Sadly, after two further albums, Can were no more. This proved ironic. While Can split-up in 1979, later that year, Holger resumed his solo career with Movie! It featured a newly enlivened Holger Czukay. He embarked upon a creative spree that included a string of albums and collaborations. Through the eighties, nineties and beyond, Holger continued to create groundbreaking music that introduced his music to a much wider audience. However, the album that started this creative spree was Movie! 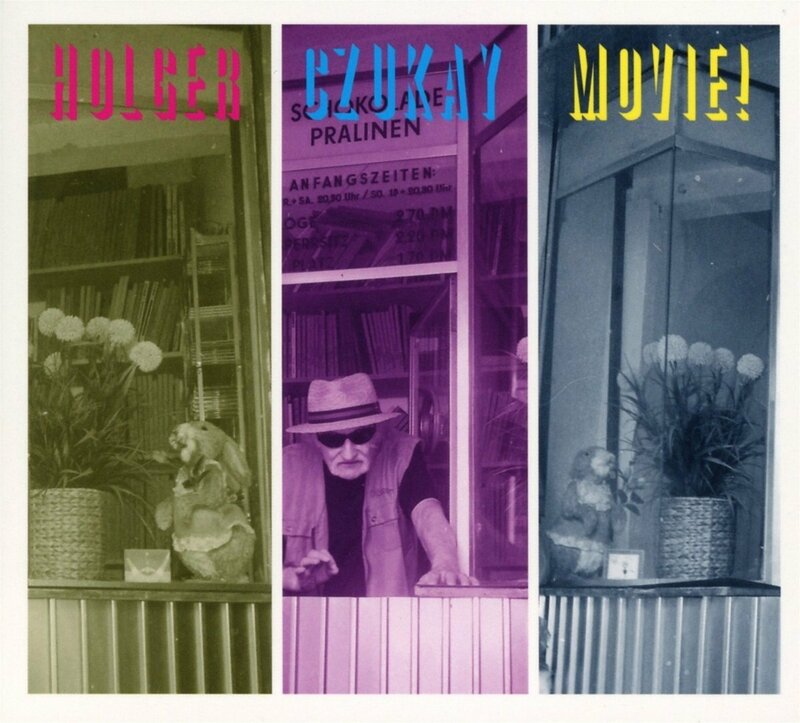 Holger Czukay’s sophomore album will be reissued by Gronland Records, on 3rd June as Movie! This reissue comes complete with a new album cover, and an instrumental version of Cool In The Pool. The original version of Cool In The Pool is a truly irresistible, hook-laden track. This whets the listener’s appetite for what was the finest album of Holger Czukay’s long and illustrious solo career. Movie! features a musical pioneer at the peak of his powers, on a genre-melting album. Holger combines elements of Afro-Reggae, avant-garde, disco, funk, pop, progressive rock, rock and world music. These genres are combined by Holger, as he incorporates a myriad of musical instruments, sounds and samples. Indeed, sampling and editing played an important part in the sound and success of Movie! Holger has used sampling throughout his long and illustrious career. Indeed, he was one of the pioneers of sampling, and used sampling extensively on Movie! That was also the case with editing, which Holger pioneered from the early days of Can. After lengthy jams, Holger edited the various takes, splicing the parts together to make a complete track. This was the case on Movie!, where a myriad of instruments, sounds and samples were akin to part of a musical jigsaw which Holger had to put together. Seamlessly, Holger puts all various parts together in a way that the music on Movie! makes sense. The result is an album that’s variously beautiful, captivating, cinematic, dramatic, hook-laden, irresistible and melodic. After three year years away from making music, Holger Czukay returned with Movie! a career defining album. Movie! is the album that marked the return of one the most innovative and progressive musicians of his generation, the comeback King Holger Czukay. ← KLAUS GESING, BJORN MEYER, SAMUEL ROHRER-AMIIRA.